Hey Quietfire Fans! 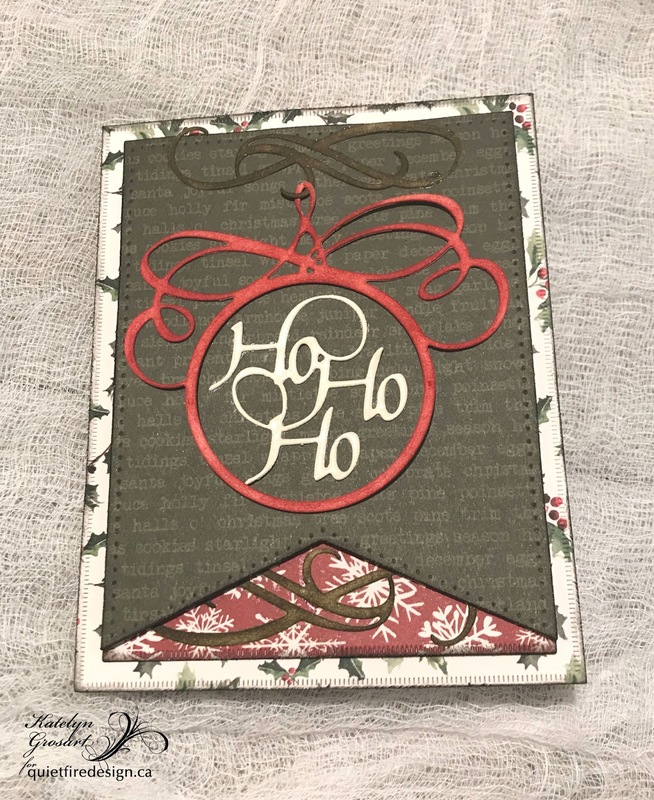 I'm thrilled to be back on the blog today sharing with you my Ho, Ho, Ho & Merry Christmas Ornament Card which features a few of the new dies. Make sure to read all the way down to the blogpost as we have a giveaway to celebrate the new release. 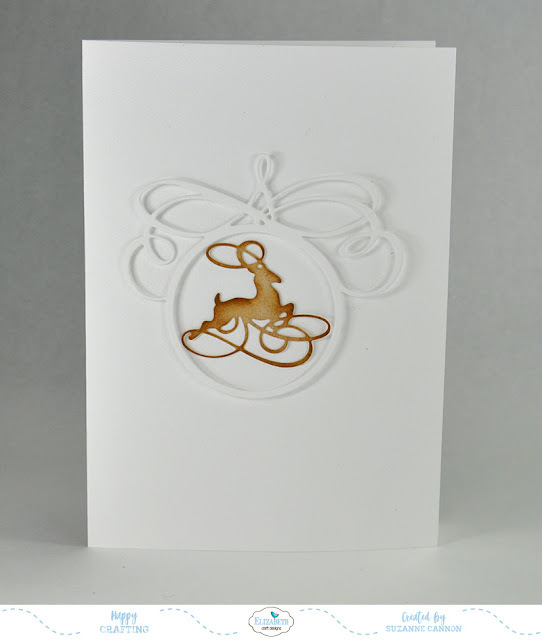 You'll want to grab a cup of your favourite Christmas beverage and learn how to recreate my card at home. To start, die cut the new small Merry Christmas die out of white cardstock. Using a blending tool with foam, blend Forest Moss Distress Ink over the entire surface of the sentiment. Meet the Flourished Christmas Minis! 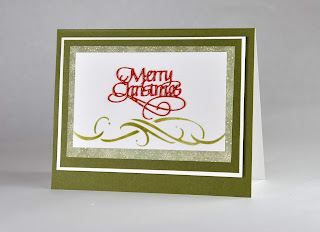 I'm over on the Elizabeth Craft Designs blog today sharing a project using the new Flourished Christmas Minis die set! 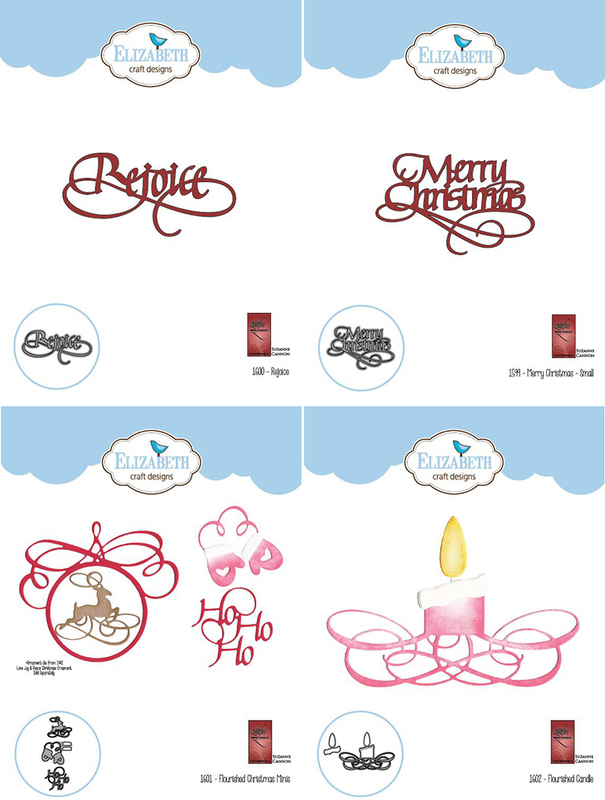 The Flourished Christmas Minis are part of a release of four A Way With Words die sets this week which you can see HERE! Each element in this set was designed to fit inside the Love Joy Peace Christmas Ornament, but they're so cute they're perfect on their own! Try pairing them with the Christmas Collection clear stamps You'll have a lot of your Christmas card list completed really quickly! And they'll be really fun to make and darn sweet! You can find the Flourished Christmas Minis on the Quietfire Design site HERE. To celebrate the new release, we're having a weeklong celebration and a giveaway! 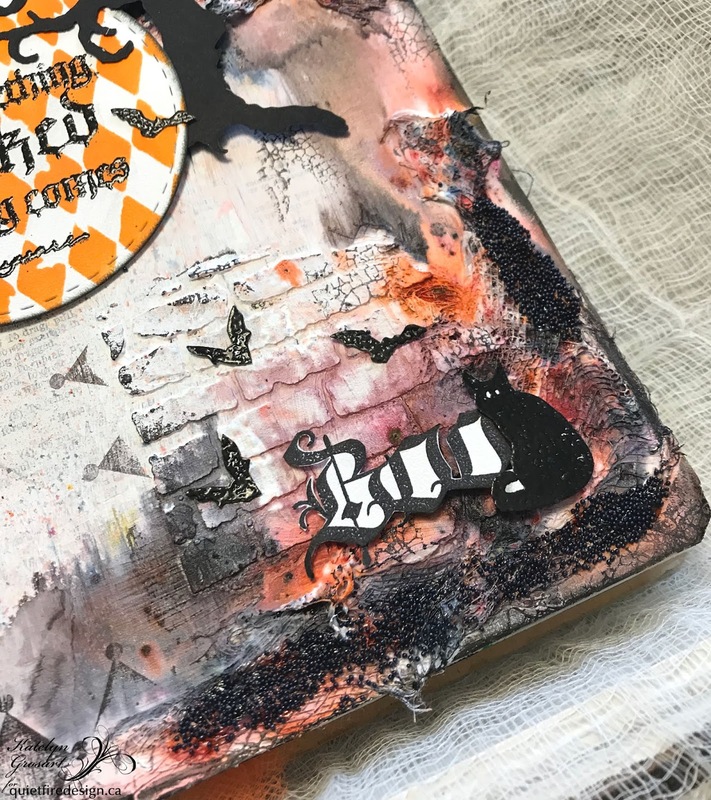 To be eligible to win, leave a comment on each blog post on the Quietfire Creations Blog from September 28th through to Friday, October 5th, 2018. We'll randomly choose three winners and send out one of the new dies to each winner! 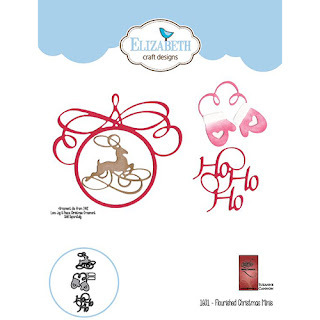 New Christmas Dies from Elizabeth Craft Designs! Oh, oh, oh! We've got new dies to play with! How much fun is that?! 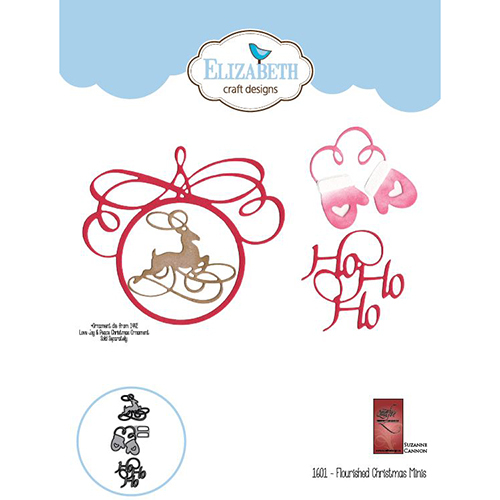 Elizabeth Craft Designs has just released four new designs that are perfect on their own or may be combined with any number of the A Way With Words dies, stamps and stencils! 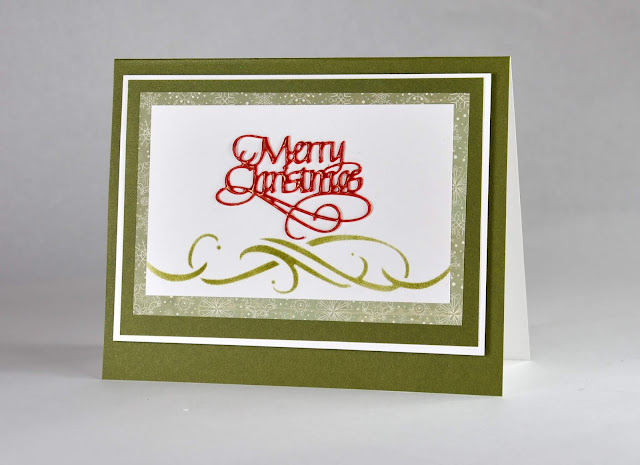 A Rejoice diecut will be perfect for Christmas or Easter - or whenever you feel like rejoicing! Merry Christmas Small is the original Merry Christmas in a reduced size for those who wish to use it to complement other images on their cards. The Flourished Candle can be used in oh-so-many ways. 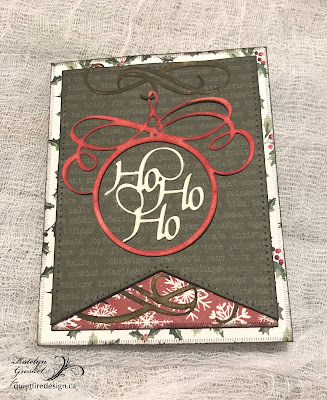 The Flourished Christmas Minis were designed to fit inside the Love Joy Peace Christmas Ornament, released last year, but each of them are adorable on their own when combined with a stamped sentiment from the A Way With Words Christmas Collection. week long celebration and a giveaway! 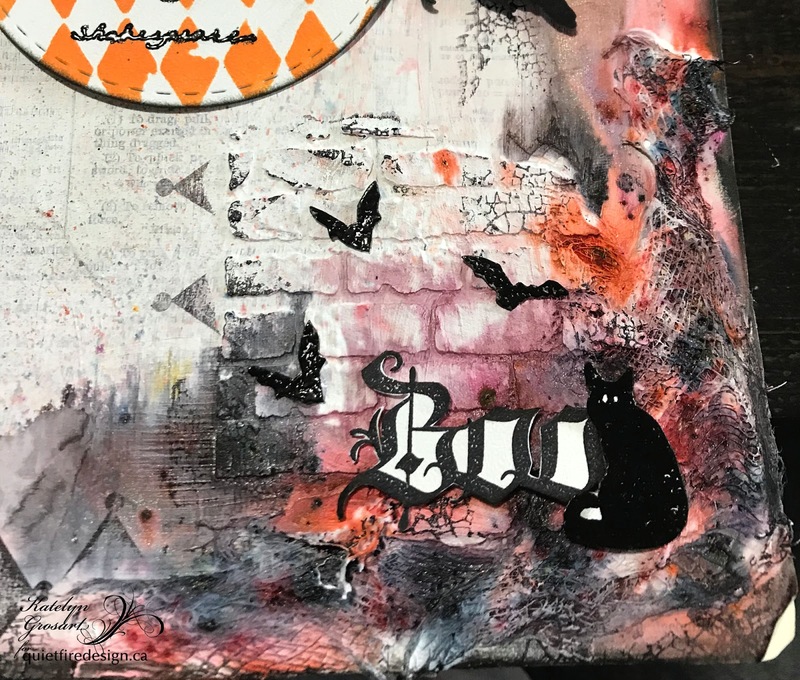 To be eligible to win, leave a comment on each blog post on the Quietfire Creations Blog from today (September 28th) through to next Friday, October 5th, 2018. 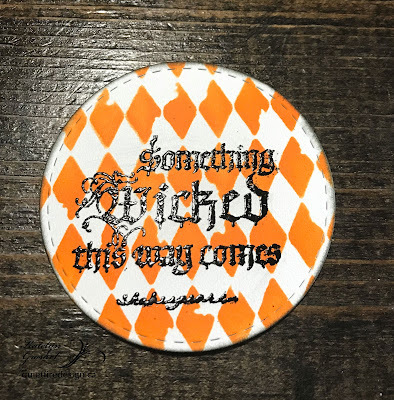 We'll randomly choose three winners and send out one of the new dies to each winner! Here is a sneak peak of some of the projects you're going to see soon! If you're in a super rush to get these, Elizabeth Craft Designs has them in stock, but I should have them soon. Thanks for having a look! Happy creating! Oh, hey! I almost forgot! Want to know how to make the card shown at the top of this blog post? Hey Quietfire Fans! 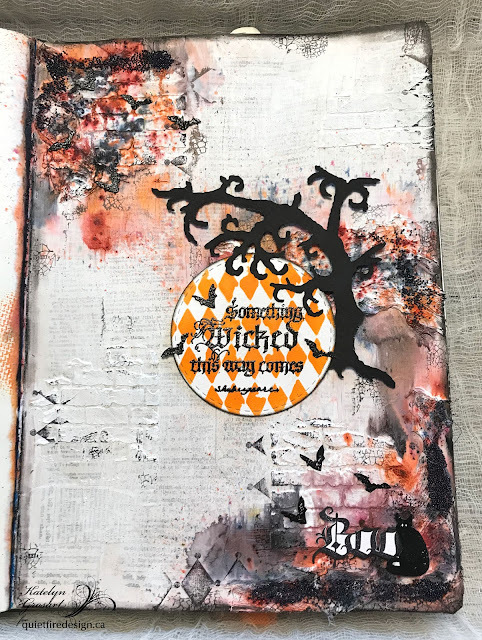 I'm thrilled to be back on the blog today sharing with you my Something Wicked Art Journal Page which features a variety of Quietfire Stamps. 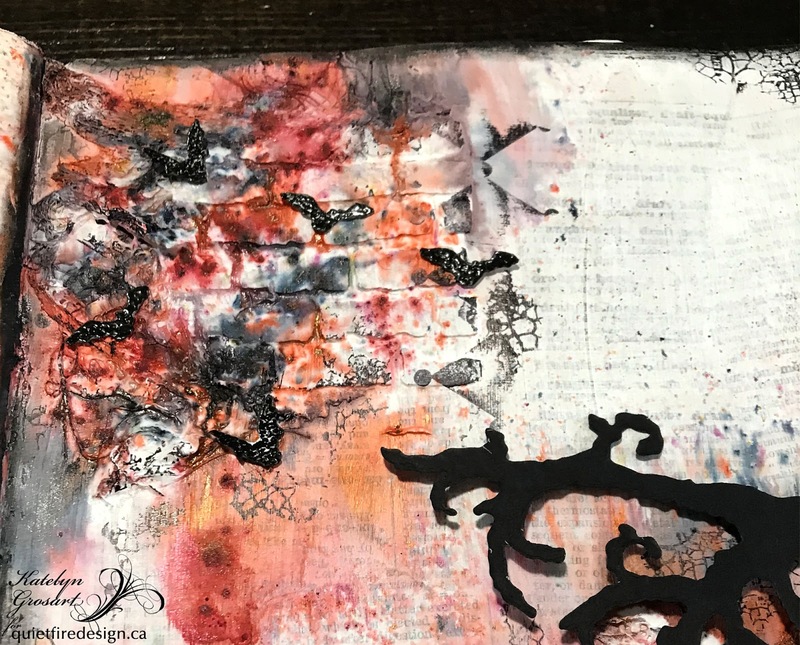 Grab a cup of your favourite fall beverage and learn how to recreate my art journal page at home. 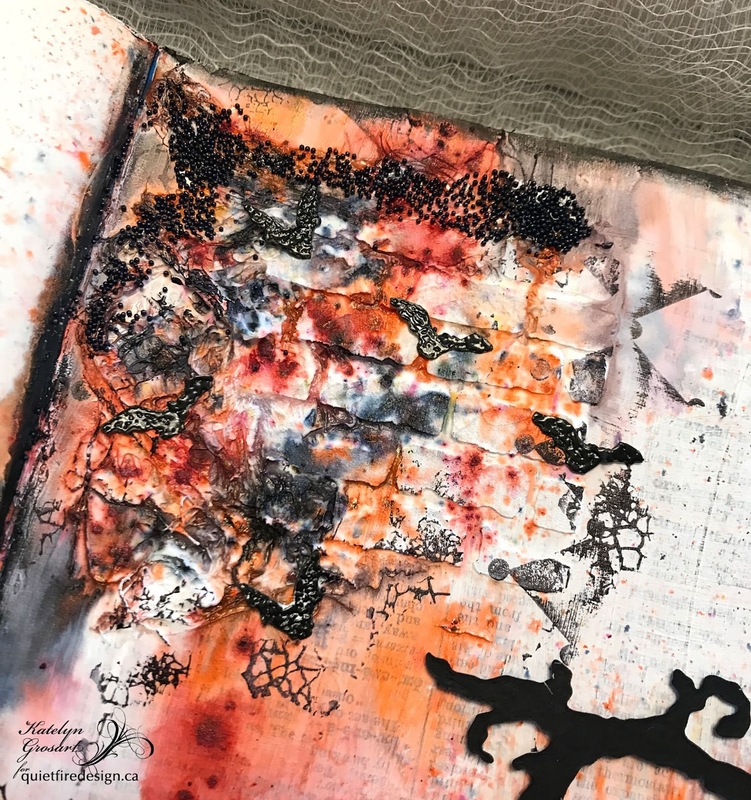 To start, choose a page in your art journal. Rip out a couple of dictionary pages from a dictionary. Randomly tear them up. 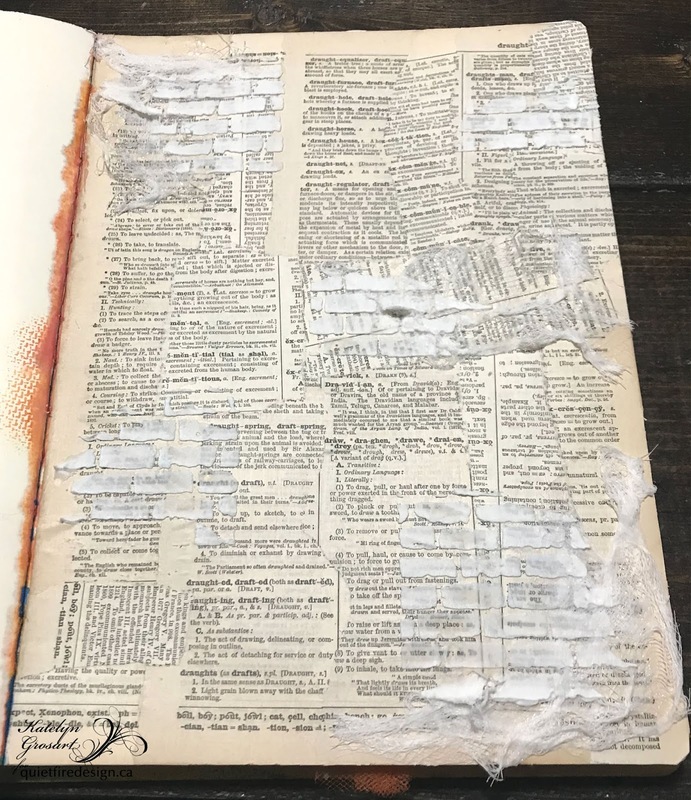 Apply Matte medium to the art journal page and adhere the ripped up dictionary pages to the page. Apply a coat of matte medium over top of the dictionary pages. If needed, dry with a heat tool. Cut three pieces of cheesecloth in varying sizes. Adhere one piece of cheesecloth in the top left corner using matte medium. 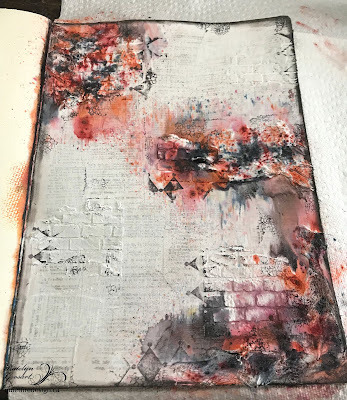 Adhere the second piece of cheesecloth in the bottom right hand corner using matte medium. Adhere the third piece of cheesecloth to the middle of the page. Let the matte medium dry. 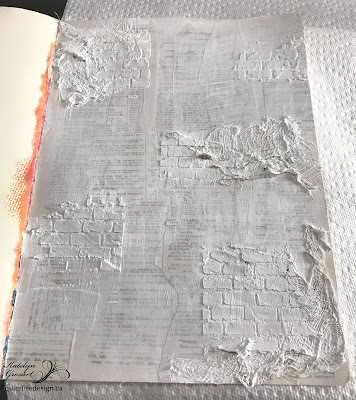 With the medium dry, place the bricked stencil in the top left corner around where the cheesecloth is. 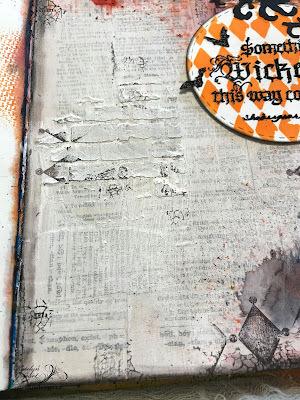 Using your platte knife, put Texture Paste Opaque Matte through the stencil. Repeat this twice more where the other cheesecloth is. 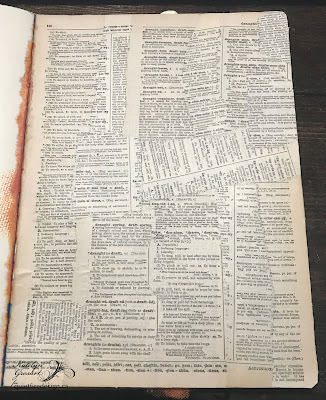 Place the bricked stencil once more on the left hand side of the page as desired. Using your platte knife, put Texture Paste Opaque Matte through the stencil. 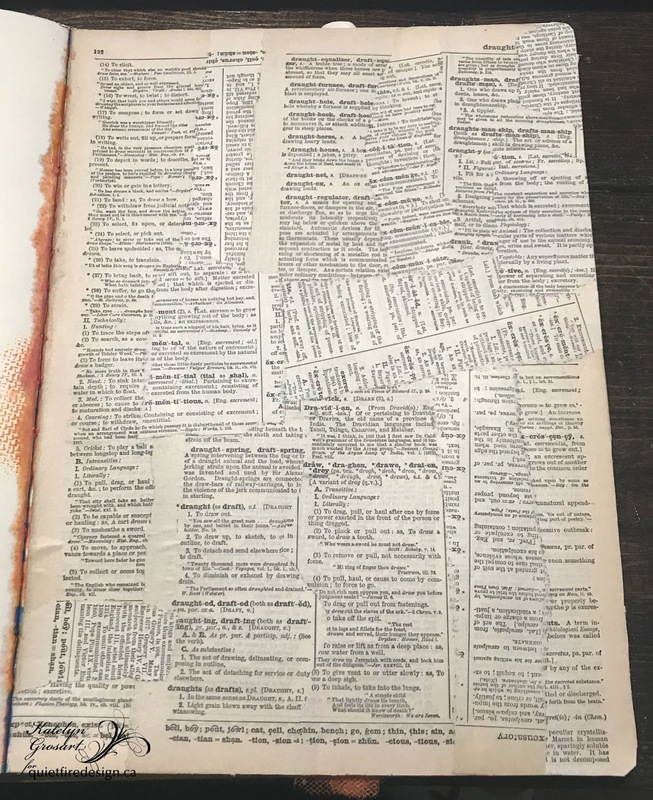 Repeat this one more time but this time on the top right side of the page. Once the texture paste has dried, apply a coat of white gesso to the entire page. Sprinkle Black Forest Black (Lindy's Stamp Gang), Cuckoo Clock Cardinal (Lindy's Stamp Gang) and Orange (Magenta Nuance) powders in the bottom right corner, top left corner and the middle part of the page where the cheese cloth is. With the powder down, spritz with water. 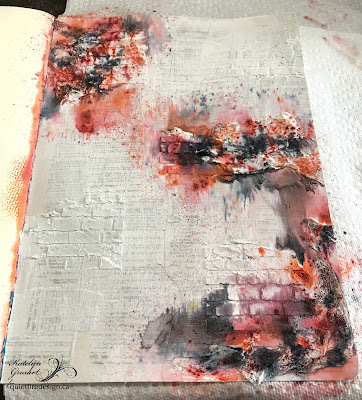 Set the page aside so that it can dry. 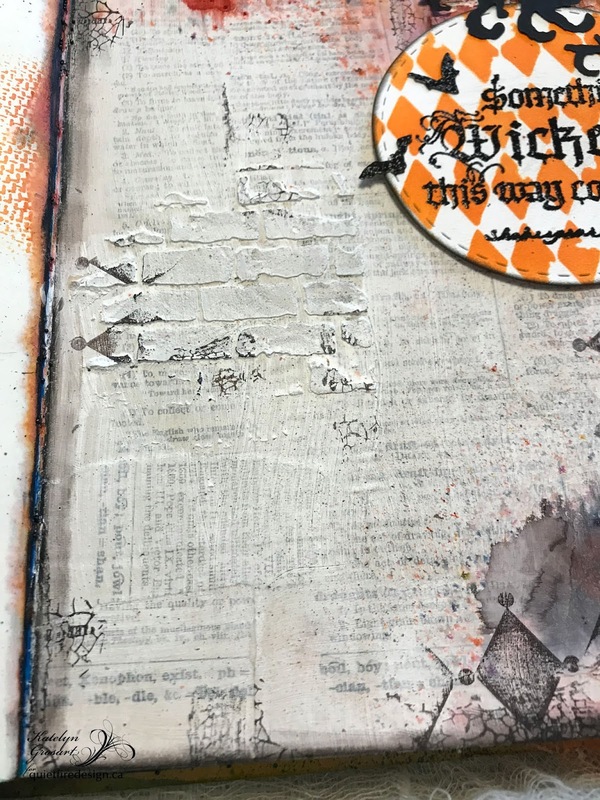 Apply Jet Black Archival Ink to the Crackle Background stamp and randomly stamp onto your art journal page as desired. Reapply ink as many times as needed. 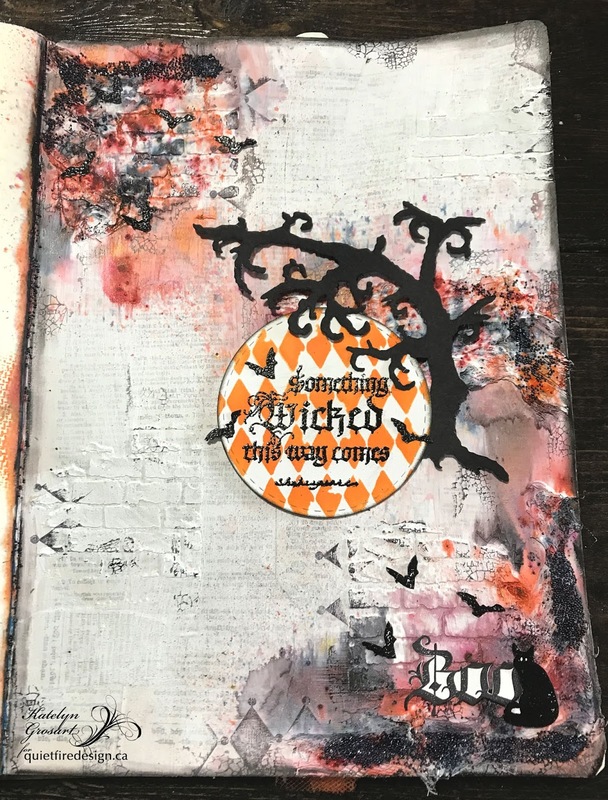 Apply Jet Black Archival Ink to the Dotted Harlequin Background stamp and randomly stamp onto your art journal page as desired. Reapply ink as many times as needed. Using a Black Soot Distress Crayon, rub it along the edges of your page with your finger. Die cut a 3 1/4" stitched circle out of white cardstock. 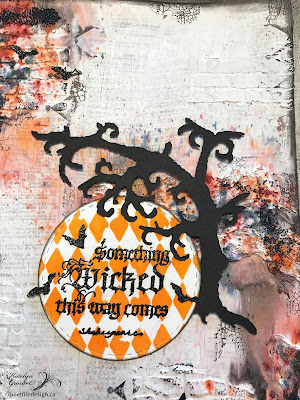 Place the Harlequin stencil overtop of the circle. Use a blending tool with foam to blend Carved Pumpkin Distress Ink through the stencil. Apply Emboss It Ink to the Something Wicked stamp and stamp onto the circle. 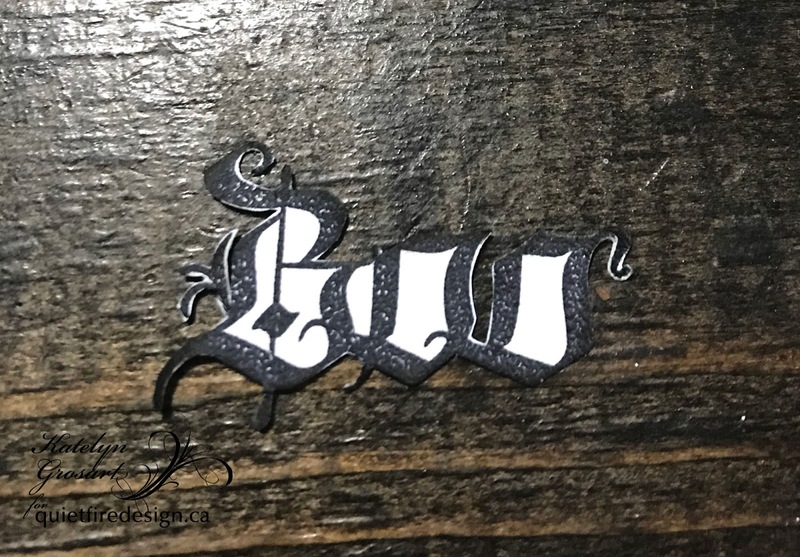 Sprinkle Midnight Black Embossing Powder overtop of the sentiment. Tap off the excess powder and emboss with a heat tool. Distress the edges of the circle. Ink the edges of the circle using Black Soot Distress Ink and a blending tool with foam. 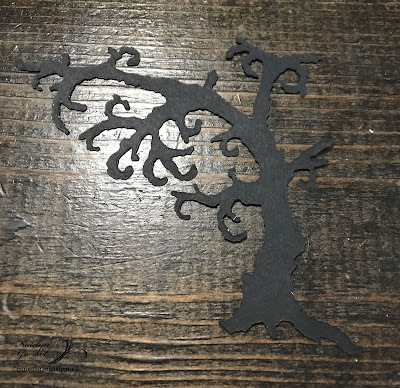 Die cut a creepy tree out of black cardstock. Apply Jet Black Archival Ink to the Boo stamp from the Something Wicked 2018 Stamp set. Stamp the boo sentiment onto a piece of white cardstock. Fussy cut the sentiment out. Ink the edges of the sentiment using Black Soot Distress Ink and a blending tool with foam. 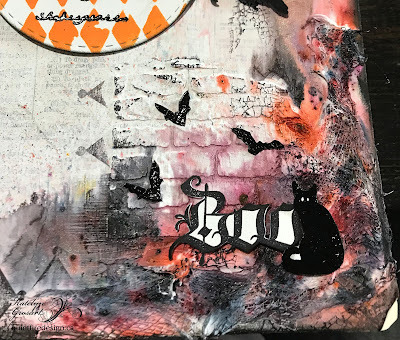 Apply Emboss It Ink to the cat stamp from the Something Wicked 2018 stamp set. Stamp onto a piece of white cardstock. 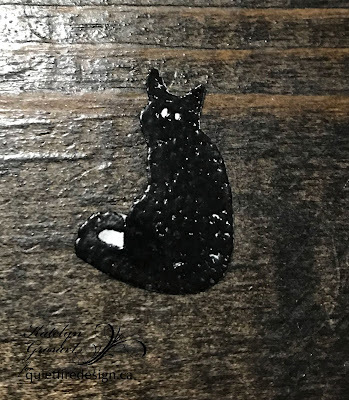 Sprinkle Midnight Black embossing powder over top of the cat. Tap off the excess powder and emboss with a heat tool. Fussy cut the cat out. 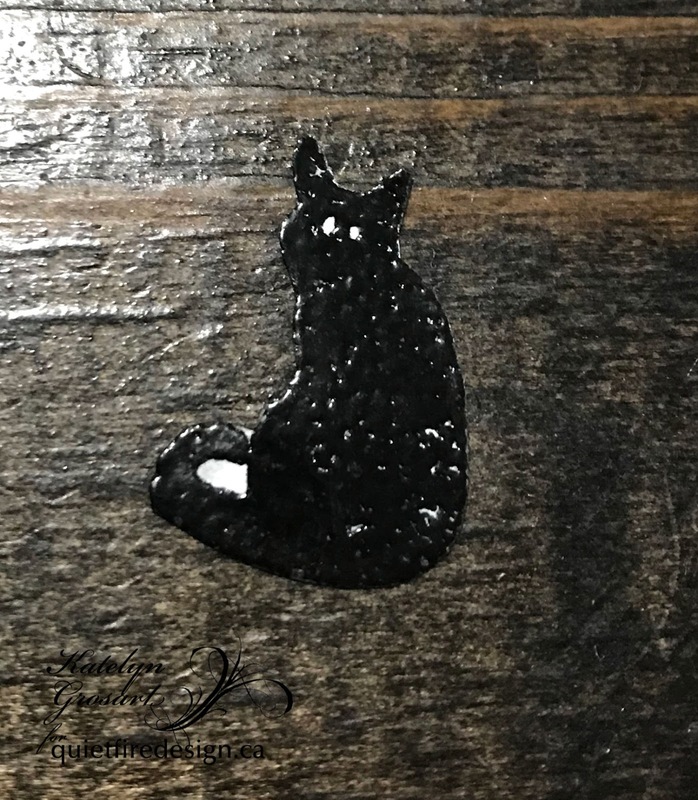 Ink the edges of the cat using Black Soot Distress Ink and a blending tool with foam. 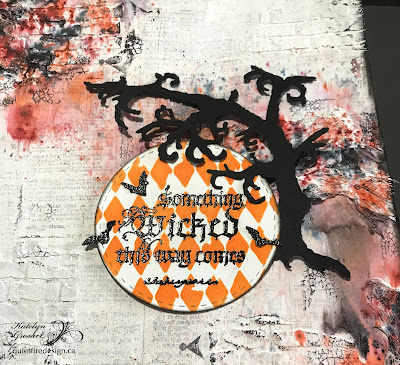 Apply Emboss It Ink to the bat stamp from the Something Wicked 2018 stamp set. 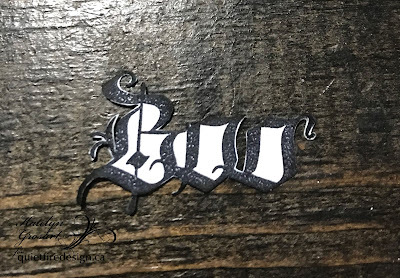 Stamp onto a piece of white cardstock. Repeat the previous step ten more times. 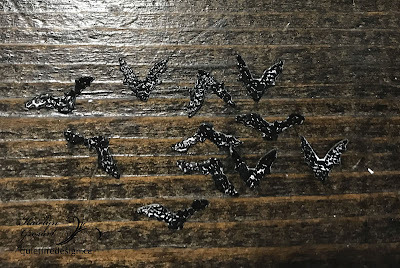 Sprinkle Midnight Black embossing powder over top of the bats. Tap off the excess powder and emboss with a heat tool. Fussy cut all the bats out. 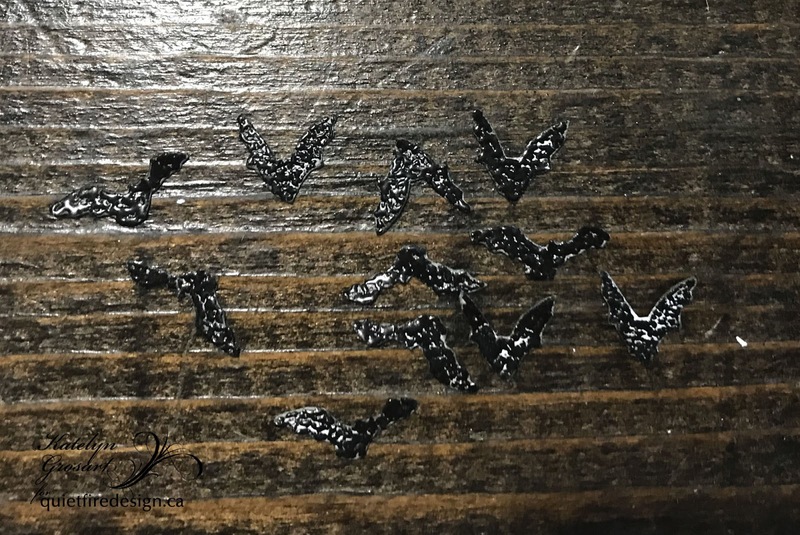 Ink the edges of all the bats using Black Soot Distress Ink and a blending tool with foam. 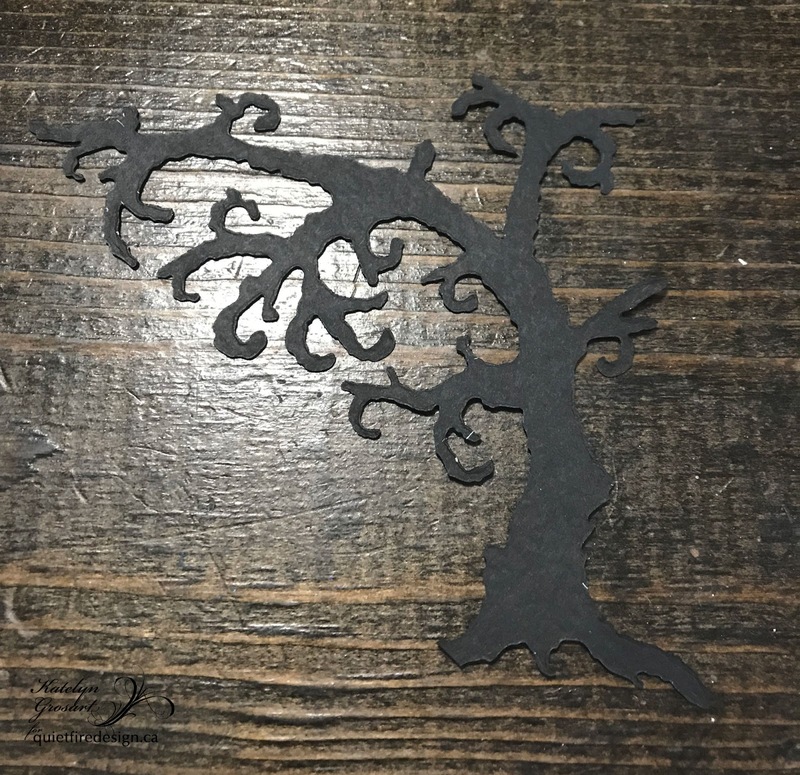 Foam square the creepy tree 1 1/4" from the right and 4 1/4" from the bottom of the page. Foam square the Something Wicked circle slightly to the left of the tree. The branches will hang over top of the circle. Adhere three of the bats around the Something Wicked sentiment. In the bottom right hand corner of the page, foam square the boo sentiment and the cat to the right of the Boo. Adhere three bats around the Boo. In the top left hand corner of the page, adhere the last five bats. To finish off the art journal page, paint on Soft Gloss Gel in the top left corner, bottom right corner and in the middle where the cheesecloth is. Sprinkle Micro Beads in Black over top of the gel. Set your page aside to allow for the gel to dry. Here are a few close up's of my Something Wicked Art Journal Page. Thanks so much for joining me today and taking a look at my project! I hope that I've inspired you to want to recreate my art journal page at home. With every leaf a miracle or "Emboss Everything"